From June till October 2014 The Vault became worldwide news for it’s unique business model and honesty of the people of Valley City, North Dakota. The story was aired or printed in over 40 countries and posted online on news sites across the world. June 20th, 2014 KVRR out of Fargo, ND did a story on The Vault and it’s unique honor system. June 21st CNN ran the story. June 23-25th the story was aired on local television stations and featured on local morning shows across the United States. June 24th David was interviewed by NY Daily News. June 25th the story appeared in the UK newspaper the Daily Mail and several UK websites. June 28th the story was featured on India.com and GhanaNation.com. June 30th the YouTube video passed 100,000 views. July 1st the story appeared on the front page of Reddit. July 2nd, in response to media requests for high resolution photographs, the community gathered in front of The Vault for a group photo to promote Valley City and Valley City family owned eateries. Over the next month David gives about 10 interviews a day. David and Kimberly start receiving calls from fans from around the world. 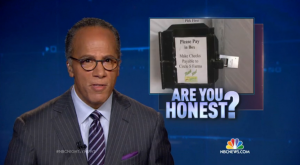 August 17th The Vault was featured on NBC Nightly News as part of a story on the honor system. August – The Associated Press runs an article on The Vault that is circulated worldwide. August – USA Today prints a story on The Vault. August – CBS News radio airs an interview with David across the country. September – The story appears on news sites worldwide. September – The Vault is mentioned on talk shows across the United States including Michael and Kelly. October – David gives interviews to radio talk shows in Argentina, Venezuela, Ghana, Guinea, Italy, England, Canada, India, Malaysia, Australia, and three different radio stations in Ireland. November – Life returns to normal…whew! Between June and October David gave over 60 interviews to newspapers, websites and radio stations. David and Kimberly received calls and emails from fans from all over the United States and from over 20 countries including…Canada, England, Ireland, Australia, Kenya, Mexico, Brazil, India, and China. The original story by Aaron Boerner. > The original clip was rerun on CNN National. 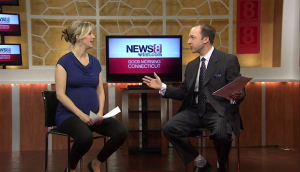 A feature on their morning show. 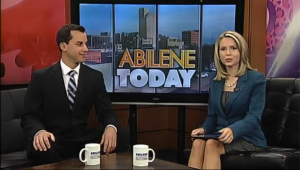 A feature on the Abilene Today show [Online Top Story of the Day]. A video remix with new comment and hip sound track. A follow up story on Valley City. How much would you leave? “Every week or so it seems like some national media outlet is doing one of those “dark side of the oil boom” stories. So it’s nice to be reminded that there’s still something pretty quaint about living here. Like the fact that at most gas stations you can fill your tank before going inside to pay. Or how about a self-serving coffee shop that runs on the honor system? Meaning you serve yourself, and pay for what you take? It’s a pretty unique way to run a business in this cynical age, and it’s working in Valley City. The business isn’t profitable yet (not unusual for a new venture), but according to the owner people aren’t just honest. They’re downright generous. They’re paying about 15 percent more than the cost of what they’re taking. An article by Victoria Taylor based on a phone interview with David. Customers at The Vault, a self-serve café in Valley City, get their own java and pay on the honor system. So far, people have been ‘extremely honest,’ the shop’s owners said. The owners of one North Dakota coffee shop have a latte trust in their customers. The Vault in Valley City is a self-serve java joint without baristas, and payment is based on an honor system. Visitors are expected to swipe their credit card or drop the correct amount of cash in the money slot before they leave. David Brekke and his wife, Kimberly, opened The Vault in October. “In this community, I thought an honor system coffee shop would make a lot of sense,” David Brekke told the Daily News. One of the perks of a staff-less coffee shop? Customers don’t feel pressured to leave, Brekke explained. “It’s a low-key hang out where a person can stay for as long as they want,” he said. “Someone said it is Valley City’s living room. People just come in and sit down.” Visitors fill their own cups and can choose from an array of baked goods, which Kimberly makes, coffee drinks and other beverages. 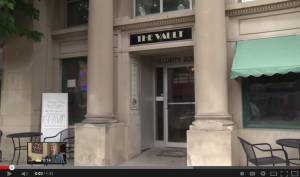 According to The Vault’s website, the cafe does have cameras, but “their primary purpose is to help provide a safe atmosphere.” Brekke told KVRR that people have been “extremely honest.” “When I add up how much has been taken and how much is in the till at the end of the day…people are 15% more generous than thieving,” he said. The coffee shop also displays and sells works by local artists. It hosts weekly movie and open mic nights, and sometimes acts as a music venue. “We’re trying to encourage arts and culture,” Brekke told The News. “Could this work in Hillsboro? Jamestown? Even Fargo? Is this totally sixth wave? “In a world of arrogant apparatchiks, biased media, and laughably dishonest pols, it’s time to take a quick break and restore a little faith in humanity. We turn to North Dakota, where one entrepreneur has discovered that trusting his neighbors to pay for their coffee is not just a good bet, but actually even better than assuming they won’t. “In the town of Valley City, North Dakota, a former bank has been renovated and is now The Vault, a go-to coffee shop for the small community. Of course it has coffee, tea, and a few pastries…otherwise it wouldn’t really be a coffee shop. But what it doesn’t have is what sets it apart — Employees. Nobody works at The Vault. The owners Kimberly and David Brekke stop by to keep it stocked, but that’s it. Prices are clearly marked for customers who get whatever they want, add up their own total, and then swipe their credit card or slip cash or check into the slot on the counter. It’s entirely run on the honor system. Is it working? Yes, it is. Congrats to the Brekkes for having the guts and creativity to try this out…and to Valley City, ND for being honest enough to make it work. It took David Rekke and his wife, Kimberly, almost four years to renovate a 1920s Valley City, North Dakota, bank building for their café, and stock it with coffee equipment, syrups, tea, a pastry case, tables, books, two pianos, and more. The one thing they forgot to add was employees. Okay, it wasn’t an oversight, but the barista-less honor-system business model going on may be an industry first, North Dakota or elsewhere. Who doesn’t love free coffee? People with principles, that’s who. A small coffee shop from Valley City, North Dakota, is the perfect place to go and observe human decency and kindness at its finest. That’s because the said coffee shop has no employees. People come in, they grab their coffee or croissant, and then pay with a credit card… BECAUSE THEY WANT TO. Owners Kimberly and David Brekke found a way to run their coffee shop with relatively no work or wages paid, while also proving that people are inherently good. Their small coffee shop has yet to break even, but it’s not because of lost revenue. According to David, people are adding 15 percent to the market value prices, proving they respect the trust this coffee shop has bestowed on them. An article by Lauren Martin. People are inherently good; you just need to give them a chance to prove it. That, or a lot more people believe in karma then we thought. Whatever the reason, one coffee shop in North Dakota, called The Vault, trusts people enough to sell coffee without employees and runs solely on the honor system. Their small coffee shop, which they keep stocked with tea, baked goods and, of course, coffee, has yet to break even, but it’s not because of lost revenue. According to David, people are adding 15 percent to the market value prices, proving they respect the trust this coffee shop has bestowed on them. 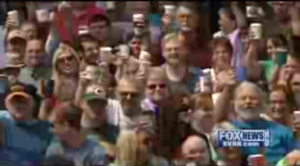 Or maybe people just hate baristas… This isn’t just a coffee shop, but a social experiment. If you’re in Valley City, North Dakota, looking for coffee or Wi-Fi and you happen upon The Vault, you will immediately notice something unusual: There are no employees at the shop. 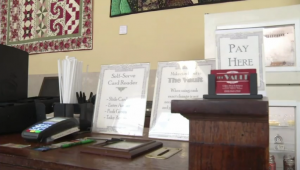 That is because The Vault is a self-serve cafe, run entirely on the honor system, KVRR reported. Patrons prepare their own coffee or tea, grab a pastry, some chips or an ice cream treat, see the price listed and leave money on the counter. There is also a credit card reader and a deposit slot for checks. WGGB News reports the shop was three and a half years in the making after the Brekkes chose a bank building to convert into the cafe. When it opened in October, the couple was surprised more places like The Vault didn’t already exist. “In this community, I thought an honor system coffee shop would make a lot of sense,” David Brekke told the New York Daily News. We hope The Vault will be one of the first of many of its kind to come. An article based on a phone interview with David. At The Vault Coffee Shop in Valley City, North Dakota, not only do you serve yourself a cup of java, you ring up your own bill too. The local joint, established last October by David and Kimberly Brekke, relies on the honors system rather than employees to keep the daily grind brewing. Serving fresh coffee and pastries, patrons select what they wish, add up the bill and pay via cash or credit card. Believe it or not, the unique venture is proving successful! In a town of just 6,000 people, profits are actually up by 15 percent. Turns out, The Vault is one-of-a-kind. David says he decided to set up the place sans employees to benefit the economics of the community, a place with almost no unemployment, where businesses compete for workers. Accordingly, he didn’t want to take from the well when it wasn’t necessary. Furthermore, the set-up lowers his financial risk. As the Brekke’s primary goal has always been to add value to the community and support local arts and culture, this policy serves multiple purposes. The Vault was built in a renovated old bank, and features an array of artwork by local artists, used books for sale, and two pianos, all of which are at a customer’s disposal. Beyond food and drink, there are gallery exhibitions, theater performances, and independent film screenings. Customers are encouraged to chat, and many gather for bible study, book club, or board games. A self–service coffee shop in North Dakota is a testament to human trust, and community support. Can a self–service store with no employees based on trust system be successful? Or will it just be stolen from? That’s exactly what David Brekke, business strategy consultant, and his wife Kimberly set to find out last October when they opened The Vault coffee shop in Valley City, North Dakota– a coffee shop that is completely self service with no employees. And as it turns out, the trust– system business model the Brekke’s pioneered is lucrative, and even more so than they anticipated. The reasons for opening the self service coffee shop were two–fold: first the Brekke’s wanted a coffee shop that was open late– the existing coffee shop in Valley city closed early. In order to have a coffee shop open late they needed to minimize overhead, and the easiest way to do that? Don’t have employees. Secondly, the Brekke’s needed to differentiate their coffee shop from the other coffee shop in Valley City that they had grown fond of and didn’t want to compete with. “If you want the full service effect you go across the street. If you want a place where you can be quiet, and sit for hours without being bothered, you go to The Vault,” David Brekke explains. And what about the problem of theft? Well, on average the Brekke’s receive 15% more money in The Vault’s cash register than goods that are taken. That’s right. People aren’t stealing– they’re actually paying more than the price of the goods they’re consuming. The Brekke’s do have cameras installed in The Vault just to be safe, and though they have noticed teenagers stealing soda on occasion, often the friends of the person who stole the soda leaves enough money to cover the cost of the beverage that was taken. And don’t be too quick to write off Vault coffee as a one–of because it is located in a small town. David Brekke thinks the idea could work in larger communities too, “I don’t think it’s about the size [of the town], I think it’s about the nature of the people in the community and how close knit that community is. It’s all about the relationships of those people,” Brekke explains. You might not see baristas going anywhere anytime soon, but The Vault, if nothing else, is a breath of fresh air for human trust and an example of how success isn’t about individuals, it’s about a community. If you have trust in the community, and a belief that people are generally good, which they are, then you can push the boundaries of what we conceive a business to be, and open a coffee shop without employees, and maybe someday we won’t have to lock our doors, or worry about walking alone at night. But for now I’ll settle for getting my own coffee.